At the risk of being one of those bloggers who never quit sharing their vacation pictures with the world, I'm going to show you just a couple more... but only because they demonstrate the awesome diversity of Colorado's landscape. One afternoon we were sitting at our sand-padded, tin-roofed campsite when we noticed an odd glow at the far end of the property. 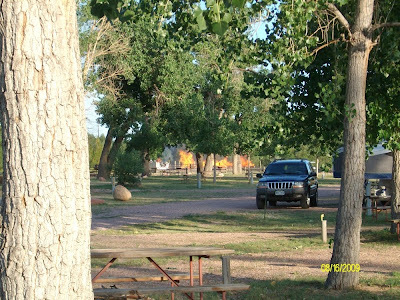 But this was no ordinary campfire mishap. 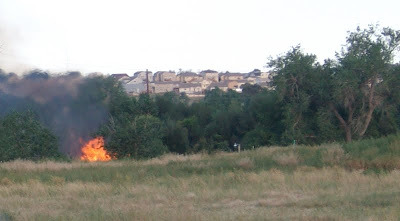 Within a few minutes this thing had erupted into a 100 foot blaze-gone-wild. Quick! Somebody... get the hot dogs and marshmallows! 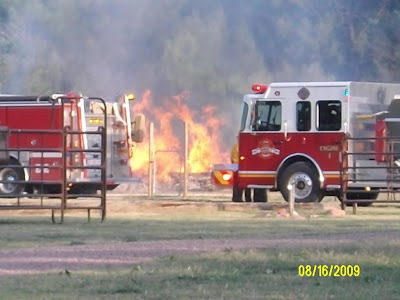 An hour later the special "brush unit" squad had the blaze under control. Thankfully no one was injured and no tents were melted. 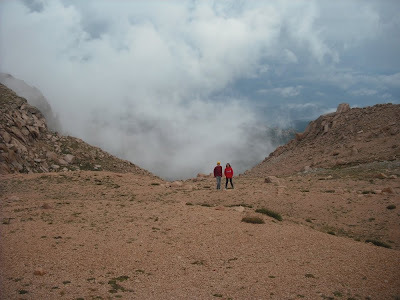 The very next day we put our minivan in low gear and headed to the top of Pike's Peak. It was a beautiful, although white-knuckled drive, up a very narrow road with deadly unprotected cliffs just mere feet away from my tires. I couldn't have been more nervous. 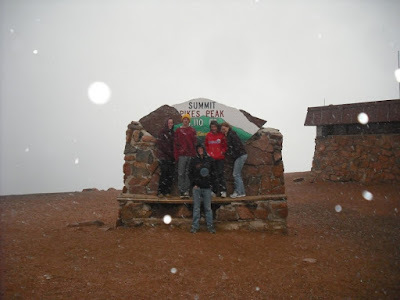 When we finally got to the 14,110 ft summit it was a very cool 32 degrees - and a raging blizzard! We hadn't been at the top for more than 15 minutes when the authorities started screaming that we had to head down the mountain NOW! Apparently there was a tornado heading toward us and they had no idea how it was going to affect the trip down. Oh, but we weren't supposed to go too fast because the road was going to be dangerous. Right. So there you have it, the LAST of my vacation pictures. I promise. depending on whether the job applications I've submitted garner any responses. Amazing pictures. We thought about moving to Colorado awhile ago. The Loveland-Fort Collins area attracted us, but Colorado Springs is nice too. I'm crossing my fingers (and toes) for you to hear some good news about the job search! 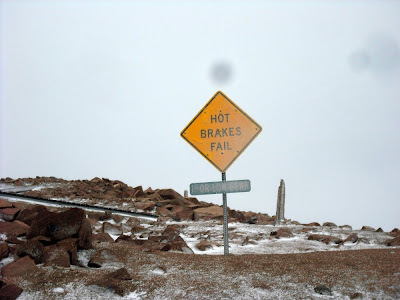 Oh I've been on a few of those scary roads too! We have one here called 'Snakes Pass' It speaks for itself doesn't it? I also went over the Pyrenees Mountains on a coach and made the mistake of sitting at the front. The front end of the coach hangs completely over the edge at every turn! Lucky you, a ready made fire for your brats. Wow, that is some exciting trip. Of course, I wouldn't expect anything else from you, having read many of your harrowing hotel stories! Best of luck with the job search, and the possible move to the Centennial State. I'll be joining you when you move to Colorado. I've only ever been to Denver to visit a friend, but everything I know and hear about it makes me want to live there. Except after reading this post, it sounds kinda dangers. Fires? Blizzards? Tornadoes? Moses? I dunno. Maybe I should stay in the boring but relatively safe Midwest. idaho dad - Charli and I have been all over CO and we love it all. I'll have to make sure I get a job that involves lots of local travel. babs - Um, yeah... no thanks. I got the shakes just reading that. bill - Oh no... I would never throw my kids into the fire. And shame on you for calling your grandchildren brats. mom thumb - Hey, we had no harrowing hotel stories this time... only a harrowing tent story. Did I write about our big night-o-storms? jd - Yeah, that Moses is like Bigfoot... lots of evidence but no sightings! Wow, so you applied for jobs in Colorado? How exciting! But you know, you'd have to change the name of your blog. I LOVE vacation pictures, keep em coming! Wow those are some amazing photos. I guess if you move to Denver you'll be the View from the Mile?